The members of the Duck River Garden Club (DRGC) are extending an invitation to the public to join them on Wednesday, Dec. 5, at 6:30 p.m. at the Rogers Lake Community Center for their annual Christmas wreath-making. Once again the DRGC offers the opportunity to bring joy to our neighbors, as members of the club and community join together in the holiday spirit of giving. 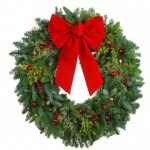 Many large wreaths are made and delivered to town buildings in Old Lyme. The Club also makes tussie/mussies to decorate trays that Meals on Wheels deliver to Old Saybrook and Lyme and Old Lyme residents. It is a lovely Christmas workshop with music and refreshments, which make everyone’s efforts so enjoyable.